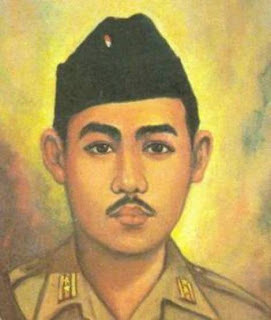 Posthumous military Colonel I Gusti Ngurah Rai (born in the village of Carangsari, Evening, Badung regency, Bali, Dutch East Indies, January 30, 1917 - died in Marga, Tabanan, Bali, Indonesia, 20 November 1946 at the age of 29 years) is an Indonesian hero of Badung regency, Bali. Together with 1372 members fighters MBO (Headquarters Oemoem) Council of the Republic of Indonesia Perjoeangan Lesser Sunda (DPRI SK) Monument Complex made tombstones at Sunda Eilanden de Kleine, Temple Marga, Tabanan. Detailed struggle I Gusti Ngurah Rai and CW regiment can be seen in several books, such as "guerrilla Together Ngurah Rai" (Denpasar: BP, 1994) testimony of one of his staff MBO DPRI SK, I Gusti Bagus Meraku Tirtayasa winning "Grace Harkitnas Journalism 1993", book "People Around Mr. Rai: The story of the Friends of the National Hero Brigadier General (posthumously) I Gusti Ngurah Rai" (Denpasar: Upada Literature, 1995), or the book "Puputan Margarana Date 20 November 1946" compiled by Wayan Djegug A Giri (Denpasar: YKP, 1990). The Indonesian government confers Mahaputra star and promoted to Brigadier General (posthumously). His name was later immortalized in the name of the airport in Bali, Ngurah Rai. I Gusti Ngurah Rai is a national hero origin Bali (Bali) who died in a fierce battle against the Dutch in Tabanan, Bali. The battle is known by the term Puputan Margarana. He was born in Badung regency sari Carang January 30, 1917, and died 20 November 1946 and then buried in the temple tabanan Marga Bali. His father was named I Gusti Ngurah Trench who is a foreign (district-level positions). After completing his education at Denpasar and MULO in Malang, in 1936 he continued his education at the School of Military Cadres in Gianyar Bali. Furthermore enrolled in Voor Reserve Corps Opleiding Officieren (CORO), Magelang. During the Japanese occupation, Ngurah Rai worked as an intelligence allies in Bali and Lombok. After independence the government of Indonesia Indonesia I Gusti Ngurah Rai forming the Sunda TKR Kecildan he became commanding officer with the rank of Colonel Letnal. Ngurah Rai then go to Yogyakarta to consolidate and get directions from the leadership of TKR. Returning from Yogyakarta, Bali was already occupied Netherlands.I Gusti Ngurah Rai then formed his troops had scattered beraidan to name Ciung Vanara army. After that they do a raid on the Dutch position in the village of Marga Tabanan Bali. Dutch then launched a massive attack by land and air. Ngurah Rai then asked his troops to war bellows (all-out). He was killed along with all his troops in northeast tabanan (South Bali). The war known as Puputan Margarana. In honor of his services, the Government of Indonesia to give the title of national hero by Presidential Decree No. 63/TK/1975 dated August 9, 1975.